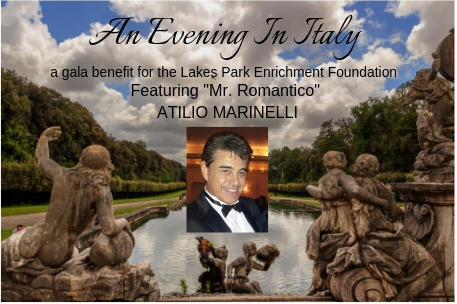 The Lakes Park Enrichment Foundation is sponsoring a magical night of Italian music, food and drink to benefit projects in Lakes Park. You’re invited to join us! This party will take place poolside at beautiful, new Amavida Living (located right outside the park on Gladiolus Drive) on Thursday, April 11, 5:30-8:30 pm. Atilio Marinelli, a classically trained dramatic tenor with a beautiful voice, will provide the entertainment for listening and dancing.